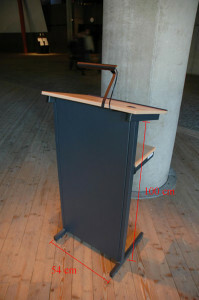 The following equipment is available without any additional cost at our events in the Ship Hall. Oil lamps (for outdoor use), red carpets and bollards. Above the entrance doors is a digital information board. Here you can greet your guests with a personal welcoming text. Email the text to the events office at least one day before the visit. There is a white screen available for digital projections such as logos inside the museum. Technical information: jpg, gif or eps, minimum size 1024×768 pix. When using power point, please convert the file to the design 16:9. Email the logo to the events office at least one day before the visit. 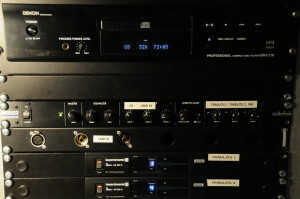 Audio system for speeches with wireless microphones and stands is included in the Ship Hall. Background music via CD or via Line In can be used free of charge. Basic stage lights are available. 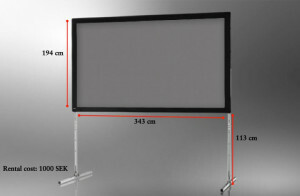 Read more about our stage light here. Chairs, tables, table set up with fresh ivory. Linen cloth from Klässbols Linneväveri with the “Vasekärven” imbedded. 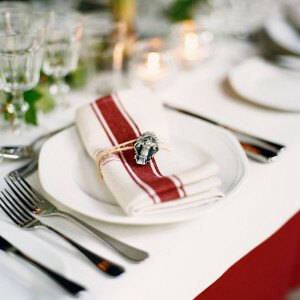 The napkin ring is part of the setting but not to be taken from the museum. If taken, a fee will be deducted the client. 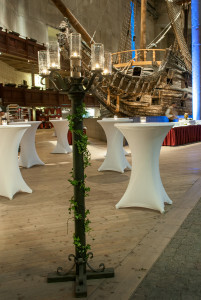 Rent our beautiful candelabras – An atmosphere riser. 500 SEK/piece ex. VAT. Total: 8 pieces. 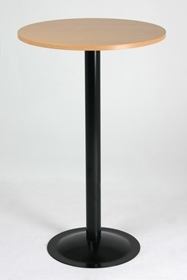 The high tables shown in picture below can be rented from an external supplier via the restaurant. 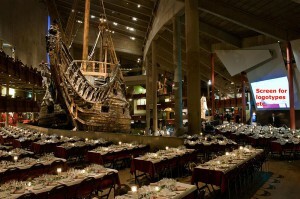 Menus, high tables for standing receptions and various extra equipment can be rented via the restaurant at restaurangen.vasa@maritima.se . 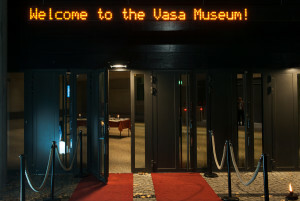 For stage rental please contact the Events Office at the museum at evenemang.vasa@maritima.se.